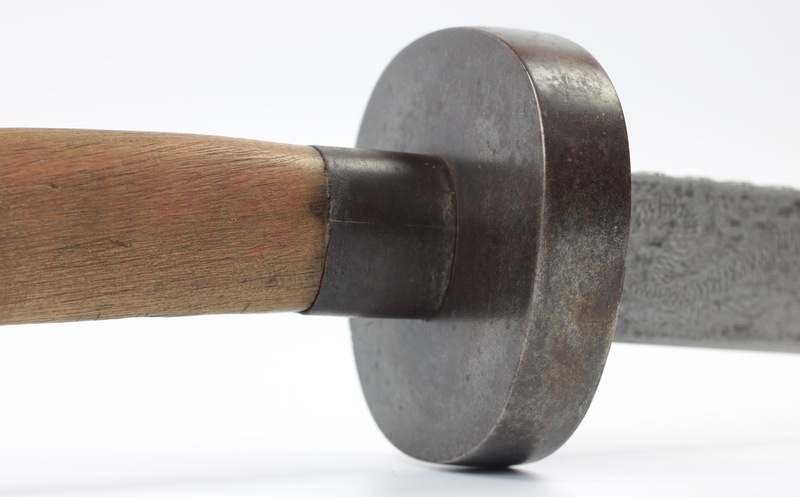 The niuweidao or "oxtail saber" is a late form of Chinese saber, developed in civilian circles at around the mid. nineteenth century. Its introduction coincided with Chinese access to superior Western firepower that finally made traditional Chinese armors obsolete. It's characteristic blade flattens and widens considerably near the center of percussion, creating a fairly thin edge on a sweeping arc; perfect for deep cuts against soft, unarmored targets. 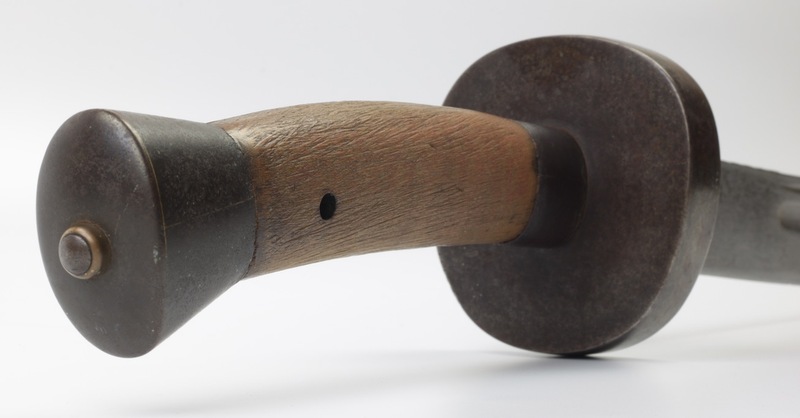 This specialized design made the niuweidao immensely popular among rebels and their enemies in the social unrest that lead to the fall of the Qing, and the chaos that ensued in the Warlord Period of the early 20th century. 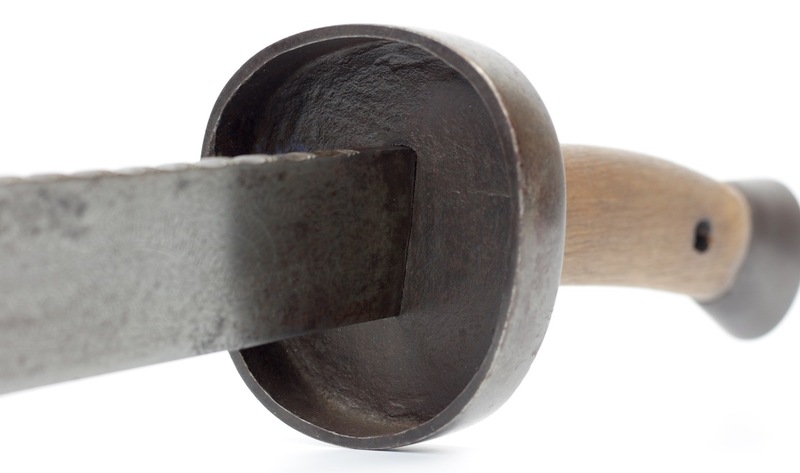 The large and heavy blade is well-balanced, of good steel and rings like a bell when struck. The fittings are of blackened iron, expertly brazed with brass leaving very thin, even lines between the various parts. Fit and finish of all parts is top-notch, and far superior to the work on the majority of niuweidao . 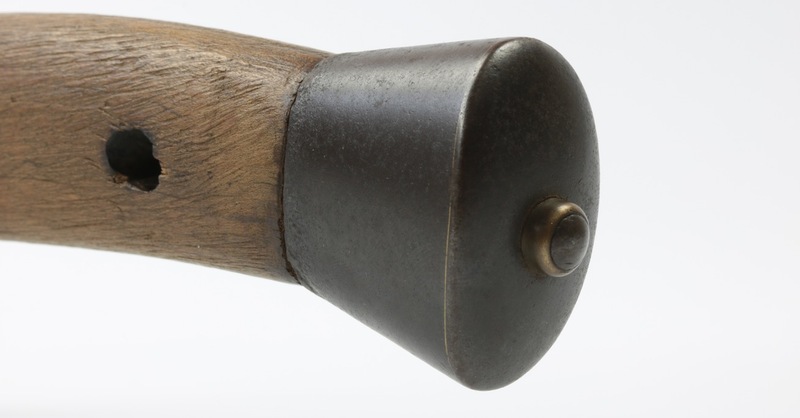 The handle is plain wood, and looks as it is was never wrapped because it is flush with the fittings. It also shows signs of lots of handling on the bare wood, smoothening out the wood grain. At the base, the back of the blade is filed, creating an effect reminiscent of bamboo sections. This is a fairly common feature on Chinese single edged weapons, possibly referring to celebrated the strength and resilience of bamboo in Chinese culture. The 20th year of the Guangxu reign corresponds roughly to 1895 in the Gregorian calendar, five years before the outbreak of the Boxer Rebellion. It also includes a shop name, Zi Qin Ji (子勤記) or "Diligent Work Brand". 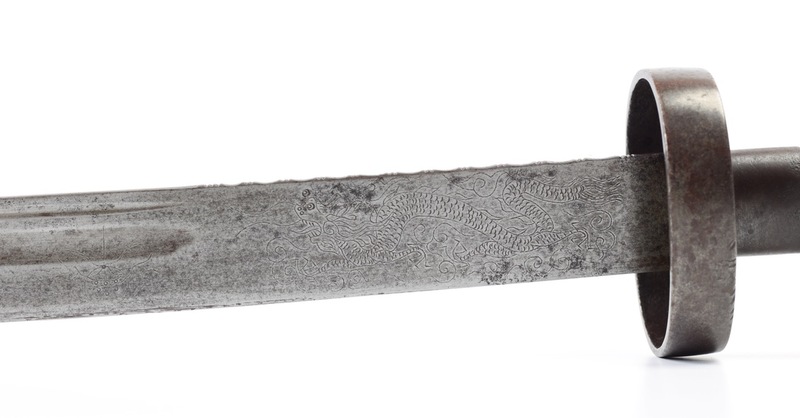 It is the only saber I've seen so far that has a shop name chiseled in the blade. 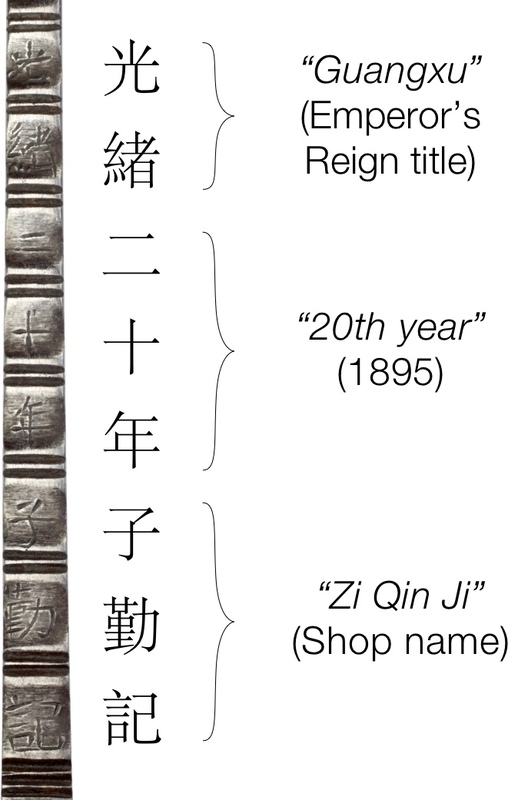 Most shops bearing such a name would use a person's family name, but Zi Qin (子勤) sounds like it may be a person's first name. Ziqin may well be a famous swordsmith of the late 19th century. 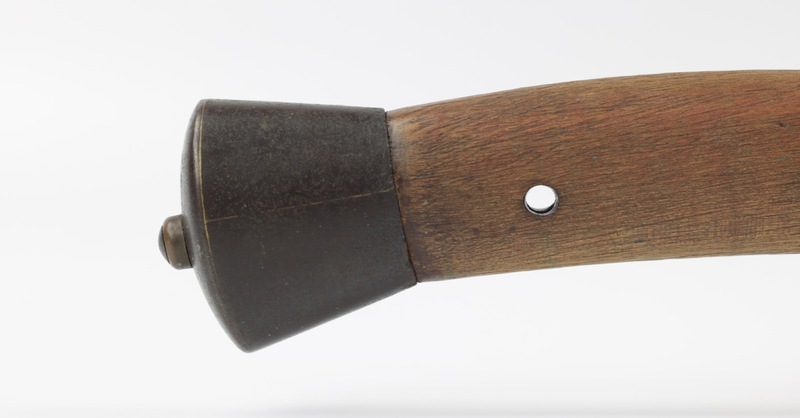 The reign mark on this weapon is also highly unusual, and probably suggest that this was a designated shop that was appointed to also do work for the court. 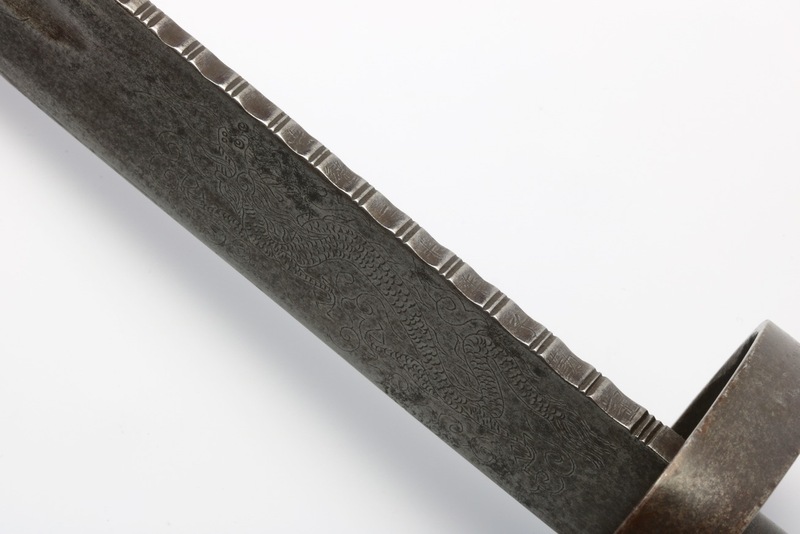 The superior finish of this sword compared to most edged weapons of the time, including late 19th century military sabers that were often of careless workmanship, indicate it stood well above the rest in terms of quality in this period. 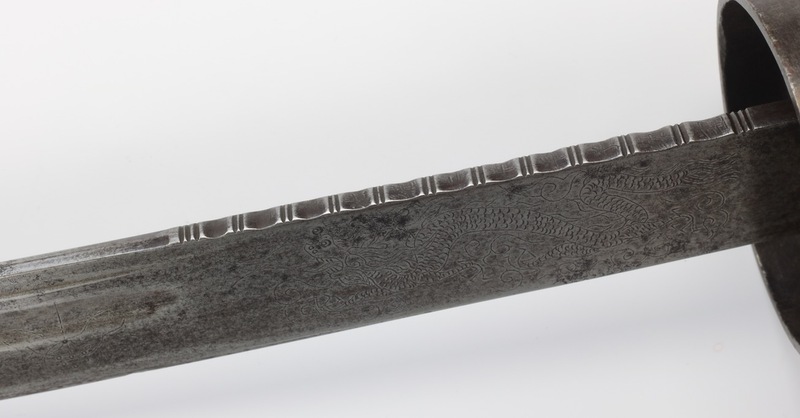 On either side of the blade are chiseled in very fine lines a dragon chasing a pearl. 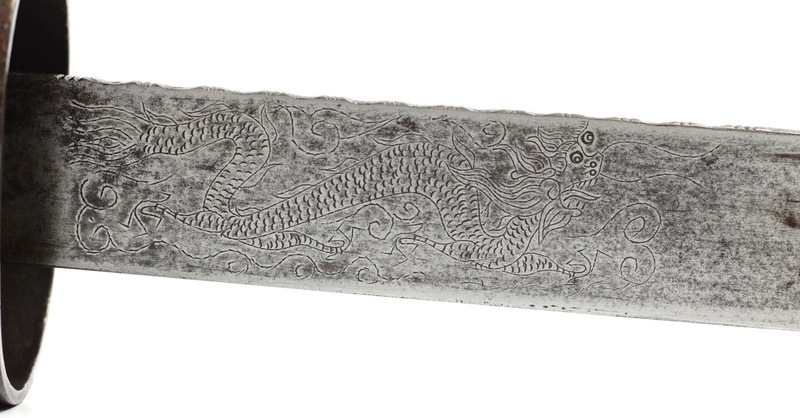 These are common motifs on swords and sabers of the period but most of them have three clawed dragons that have no imperial association whatsoever, and are purely decorative. This example has four clawed dragons, a motif that was originally designated for certain princes and the higher ranks of the Qing administration. It must be noted though, that by the end of the 19th century imperial standards slid and lower ranks were known to wear insignia that made them appear higher in rank than they were. 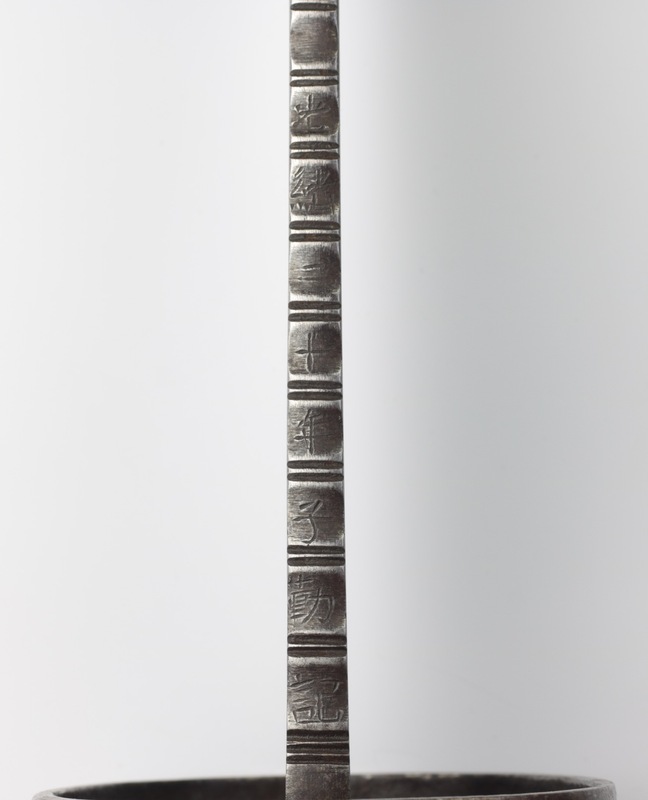 An impressive oxtail saber, of excellent workmanship, bearing Guangxu reign marks and a maker's mark. The marks place it in 1895, five years before the outbreak of the Boxer Rebellion.